From 15 October 2018, Working with Children Check will be introducing a new card design. A QR code on the rear of the card can be scanned by a mobile phone (with internet access) to check the validity and status of the card. Please note you can still use your existing card, if valid. The list of acceptable POI documents will expand, adding many commonly held cards and documents. Documents will be classified as primary or secondary, replacing the existing 100 point system. Victorian applicants will be able to securely verify their identity online. This will save them time at the counter of a participating Australia Post outlet as they will need to only present one acceptable photo identification document to finalise their application. Electronic identity verification is a secure service. The applicant's details are securely submitted to the Australian Government's Document Verification Service (DVS), which compares the identifying information with available government records. If an applicant is unable to have their identification verified electronically, or they choose not to, in-person verification at Australia Post will still be possible. Applicants will need to present multiple POI documents at the counter to finalise their application. Victorian applicants will no longer need to supply their own photo. Australia Post will provide a digital photo free of charge. The identity verification process for interstate applicants does not change, although from 5 December 2016 interstate applicants will need to present POI documents from the new list. Full details of the forthcoming changes are on the What's new page on the WWC Check website. At Werribee Primary School all volunteer helpers must have a current Working with Children Check. This means: you must have a WWC Check to assist in classrooms, canteen and school activities like excursions, camps and special events (ie athletics, swimming carnivals). Your WWC Check should be displayed at all times when helping at the school. Lanyards are available at the office near the Xuno kiosk. A volunteer can commence work in a school when they provide a receipt as proof they have applied for a WWC Check with the Department of Justice. The WWC Check is conducted by the Department of Justice. Applications must be lodged at one of the participating Australia Post outlets in Victoria. For a list of Australia Post outlets where a WWC Check application may be made see: www.auspost.com.au. 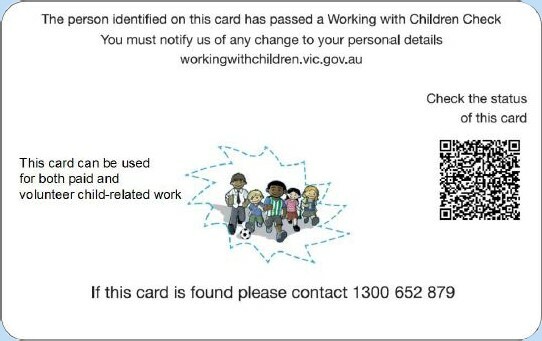 WWC Check applicants need to complete an online ‘Application for WWC Check’ form at http://www.workingwithchildren.vic.gov.au/ before going to a participating Australia Post outlet with proof of identity documents to lodge the application.